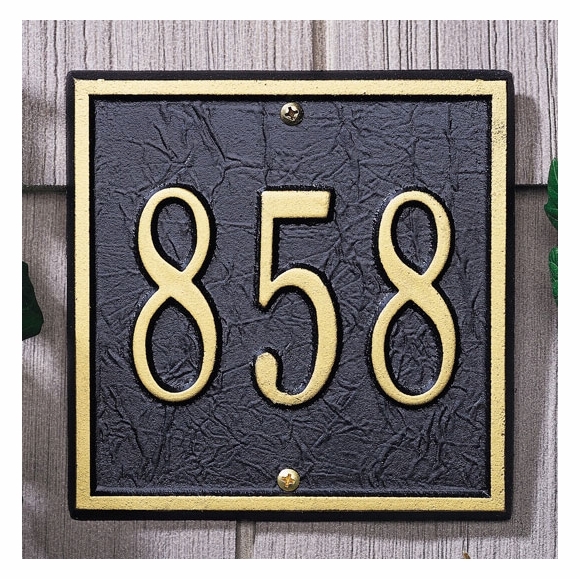 Small Square House Number Sign - - 6" x 6" petite plaque for smaller wall spaces or entryways. Made in USA. One line wall plaque holds up to three 3" characters. Eleven colors (see small images from left to right): AB antique brass, AC antique copper; BG black with gold characters; BS black with silver characters; BW black with white characters; GG green with gold characters; OB oil rubbed bronze; OG bronze with gold characters; PS pewter with silver characters; RG red with gold characters; and WG white with gold characters. 6" x 6" square address sign suitable for apartment, condo, or interior office doors. Also available in larger sizes (see Related Products).